As seniors age, the body’s ability to regulate its own temperatures will change. These changes can put seniors at a higher risk of developing various health conditions in the wintertime, including hypothermia. 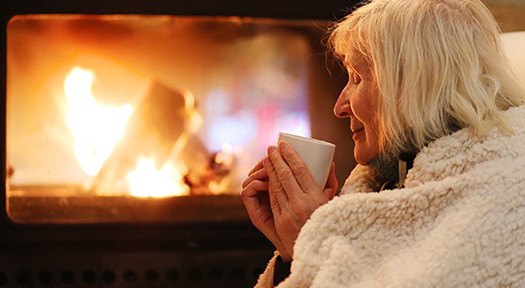 However, there are some tips family caregivers can use to help their elderly loved ones stay warm in the winter months. When it’s time to go to bed, your loved one doesn’t have to wear layers of clothing to stay warm. Instead, you can purchase flannel covers and sheets, which can prevent your loved one from being loaded down with clothes. You should also place bulkier blankets on the bed, along with heavy comforters to help your loved one stay warmer at night and eliminate the need of a space heater or other devices that could potentially be dangerous to keep plugged in throughout the night. One of the many ways to ensure your loved one remains warm and enjoys a high quality of life during the winter months is to hire a professional caregiver. In Sacramento, home care providers can benefit aging adults in a variety of ways. From cooking nutritious meals to offering timely medication reminders, the dedicated caregivers at Home Care Assistance are available to help your elderly loved one 24 hours a day, 7 days a week. If your loved one is not using a room in the home, keep its door shut. You should also shut off the heating vent in the empty room to reduce the amount of heat being used. Close the blinds and draw the curtains in the rooms your loved one doesn’t frequently use to prevent the loss of heat through the windows in the wintertime. The rooms your loved one does use will be warmer, and he or she will be more comfortable. During the winter months, the air will be drier, which could make your loved one feel colder. However, using a humidifier in the home adds moisture to the air and may help your loved one stay comfortable at a lower temperature setting. If your loved one does not own a humidifier, he or she can use houseplants to add moisture into the air. In addition to keeping your loved one warm in the wintertime, the moisture can also protect against dry and itchy skin. Issues with skin or body temperature can seriously impact your loved one’s health. Consider hiring a professional caregiver if you need someone to monitor your loved one’s wellbeing. Some seniors need occasional assistance at home, and oftentimes the family members who take care of them need time away to run errands, take a nap, go to work, or take a vacation. Sacramento, CA, respite care experts from Home Care Assistance are available on an as-needed basis, giving your family peace of mind that your loved one will remain safe and comfortable while you relax or focus on other important responsibilities. Using rugs on bare floors can reduce heat use in your loved one’s home. Make sure the rugs are nonslip to prevent your loved one from slipping and becoming injured. You should also encourage your loved one to walk around the home wearing nonslip slippers or socks to stay warm. You should remain up to date on the appliances, devices, and systems within your loved one’s home, including the heating unit. Although it is standard to change the filters in the home twice a year, you should check the filters on a monthly basis during the wintertime. Replacing the filters can increase the system’s heating quality and allow it to run more efficiently. Keep in mind the heating system will run more during the winter months, so it needs to be monitored more frequently to keep your loved one safe and warm. The cold winter months can make it difficult for older adults to manage daily tasks without assistance. If your senior loved one needs hourly or live-in care, Sacramento Home Care Assistance can help. Our caregivers can assist with exercise and mobility, prepare nutritious meals, provide timely medication reminders, and help with a wide array of other important daily tasks. Call us at 916.706.0169 to schedule a free in-home consultation.